We are pleased to offer our condo again after a 9 month complete gutting and renovation. Our unit is a penthouse unit on the top, 3rd floor with gorgeous caribbean views. We provide daily maid service, fresh towels, (cleaning) beds made etc. every day except Sunday. Totally renovated with the galley kitchen, wall removed ( the only unit to do this) to make a great room for an all open concept and a stainless chefs kitchen, fully stocked by the chef owner.Beautiful tropical grounds to surround you and with the ocean or the pool steps away.We recently arranged for some new pieces of furniture to be hand made by local craftsman. The furniture is made from 7 different kinds of wood from the area Tzalam, Cedro Rojo, Chiclem, Caracolillo, Tzalan, Katal Lox and Zapote. It is quite beautiful and their shop is about 15 minutes away by car and worth the visit. Our condo is located on the beach in a privately owned condo complex of Playasol in Puerto Morelos and is managed by our bilingual property manager. The beach is national park protected by the closest proximity of the reef on the entire Riviera Maya. Our lovely manicured tropical grounds offer a lovely large pool. Relax in the pool or go down to the pristine beach where the fine sand will never burn your feet. Swim in our warm calm reef protected caribbean with crystal clean water where you can see 25 feet to the bottom. We provide you with beach chairs, towels and umbrellas. Enjoy deep sea fishing or snorkel or dive at the marine protected reef, go to the zoo (Crococun) or ATVing to nearby fresh water caves (cenotes) or ziplining through the jungle. Take day trips to nearby Tulum or X-Caret or travel to Cancun or Playa del Carmen a short 30 minutes away. Our condo is located two blocks from the town square where multible lovely restaurants and shops surrond the square. Buy fresh fish as the fisherman bring in the catch, browse the little shops with hand made gifts or dine in the very reasonable restaurants. If you are looking for a quiet time, relax in the pool, read a book under one of our seaside palapas. Cook a meal in our gourmet chef's kitchen, or watch the sunrise or sunset on one of our front or rear veranda's or just enjoy the beautiful never ending carribean breezes from our quiet top floor condo. Ron is a semi retired businessman and Liz is a professional chef, working as a corporate VP executive chef for over 20 years and now teaches the cullinary arts.We have one daughter who is in law inforcement. Villas Playasol has the largest green area of grass, palm trees and flowering bushes of any condo complex directly on the beach.The town square is a short two blocks away on the ocean(7to 10 minute walk) and is surrounded by great reasonable restaurants and shops. It is very safe here with the locals and their children strolling into the late night hours and the town of Puerto Morelos has attracted the arts and yoga folks for years because of the magnetism of the area.It has been said that in the summer, doctors will go down to the beach and call in the dolphins to heal people. Being the only unit to remove the wall separating the kitchen from the livingroom made that area much more airy and spacious.We have the unique advantage over the ground floor units of having two porches, one in the front off the living area and one in the back off the master bedroom to take in the beautiful views.We also have installed a pressureized water system instead of depending on gravity flow as a lot of the units do. All linens provided and changed daily including beach towels. Gas stove with oven and grill. Everything you would need to cook or bake. Balcony in the front off the great room and one in the rear off the master bedroom. available to rent next door for a reasonable fee. We just returned from one of the most relaxing family vacations we have ever had! We booked this trip fairly last minute and feel so lucky to have found this condo. Ron and Liz are so nice and easy to deal with, as is the property manager Cece. The location was perfect, the property immaculate and condo exactly what we hoped for. The added bonus were the other guests and owners who were there! We made some new friends and look forward to future trips to this same spot. we are fussy who we rent to because we do live there part time and we have made extensive renovations, and they were a good choice. A truly beautiful place to stay. This property is lovely with great ocean views and tastefully decorated inside with everthing you would need. The chef owner has a full stocked kitchen with all the necessary equipment .We loved that the beach is part of the property and you need not travel to go to the beach . Also the snokleing is great as the reef is right off the beach ,also the beautiful town with all the great restaurants is about a 7 minute walk the best part of all. We had a great time at Villas Playasol. I went with my almost 4 year old and husband for a week over Christmas time. Liz was so easy to communicate with and responded quickly to all my e-mails. Cece the property manager was always available to answer questions or help in anyway. 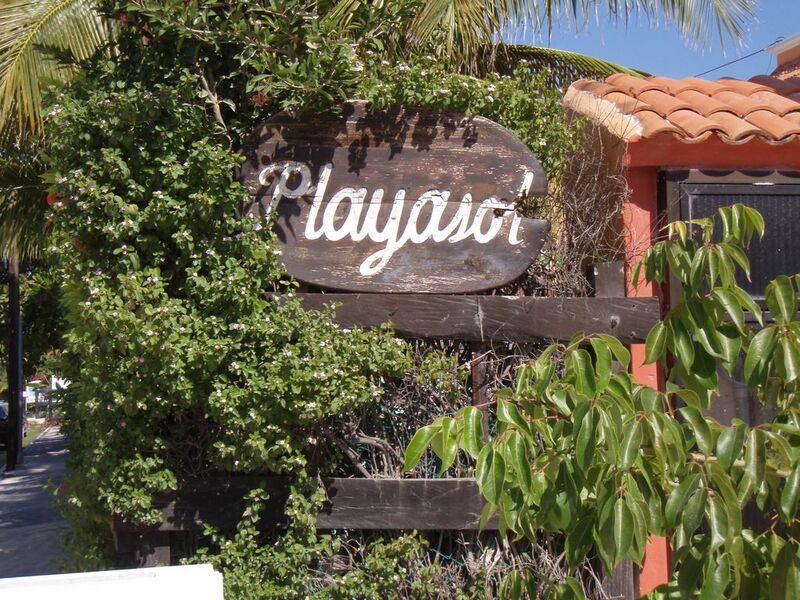 We have stayed once before in Puerto Morelos and found Villas Playasol to be the best accommodation around. The pool is excellent and the beach is a few steps away. The condo is just a few short blocks walk from town. We had an amazing time and hope to go back soon. Thanks for everything!! Katherine S.
Everything you'd want in a vacation condo......and more! We had a good feeling from the moment we first communicated with the owner of this condo. We are always a little timid when dealing with people over the internet but this condo was exactly as advertised on a fantastic white sand beach. The unit is very comfortable for two couples with an excellent compliment of kitchen accessories. It is the perfect distance from the center of town close to many quaint restaurants, grocery store and a fresh seafood market. If you like walking on the beach, you'll have miles of opportunity as it goes on forever. Snorkeling is right out your door or you can rent a boat to take you to the reef, but not necessary. The atmosphere by the pool was very comfortable and welcoming which was a nice option from the beach. I must mention the manager of the condo as she was very efficient answering all questions and dealing with any issues that arose. That's it, we would certainly return. Thanks you very much for the great review. Our condo is our home away from home so we keep and maintain it the same way. We appreciate good renters and are fussy who we rent to. Everybody ends up in the kitchen and what makes our condo special is, it is the only unit that has removed the small galley kitchen and made the area into a great room for conversation and socializing when cooking. My wife being a renown chef in the Boston area wouldn't have it any other way! The area is spectacular because of the uncrowded endless beach right on the Caribbean and the proximity to the beautiful fishing village of Puerto Morelos. We had a fabulos time at your condo,high end for sure.The furnisings are lovely as are all the amenities of a chefs kitchen. The views from the condo are perfect of the ocean. The expansieve grounds at Playasol are beautiful as is the pool. We particulary enjoyed your lovely manicured beach with hour long massages avaliable for $20.00 US dollars ( HARD TO BELIEVE) and the snorkeling so close to shore. We loved the fact that the town was only a short 10 minute walk from the condo, with so many nice reasonable restaurants.We did short trips to cenotes and zip lines through the jungle.We will be back next year for sure.